Tasked with tracking down one of the UK's most dangerous criminals DS Mark ‘Heck' Heckenburg finds the trail has run cold. He hasn’t just gone to ground, he's vanished along with several other dangerous fugitives. Heck discovers film of the wanted man engaged in a fight for his life. Someone is dispensing a violent form of justice, to bring down a dangerous conspiracy. It seems that Heck must protect some truly indefensible individuals. 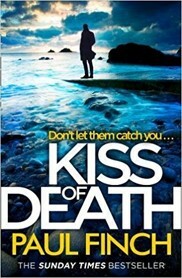 This latest edition in Paul Finch’s hugely successful series delivers his trademark mix of thrills and, perhaps, suggests that some familiar faces might not make it to the final page. The action sequences have about them a sweaty and chaotic intensity that adds to their realism. Finch also taps into the unsettlingly thin-line that separates appropriate revulsion felt towards the individuals who commit horrific crimes, and the desire for revenge. When one tips over into the other-side, terrible things can happen. Finch writes with an accuracy, informed perhaps by his former career as a police officer; including the tensions within the service. We also see the ongoing rivalry between ‘elite’ units and those tasked with fighting more mundane forms of crime and the constant pressure to deliver results with depleted resources. This is solid addition to an accomplished series by one of the best of the current crop of British crime writers.